Modern County style is an updated, fresh approach to farmhouse style. Cleaner lines, less clutter, and a bit more color create a more contemporary look with the timeless style of country charm. Today’s home by Liz Levin Interiors is located in Bethesda, Maryland, just north of Washington D.C.
A comfortable living room is beautifully decorated with soft furnishings and silver accents. Coffered ceilings are emphasized with light blue paint. A stone fireplace adds texture and simple shades allow the window architecture to be in full view. 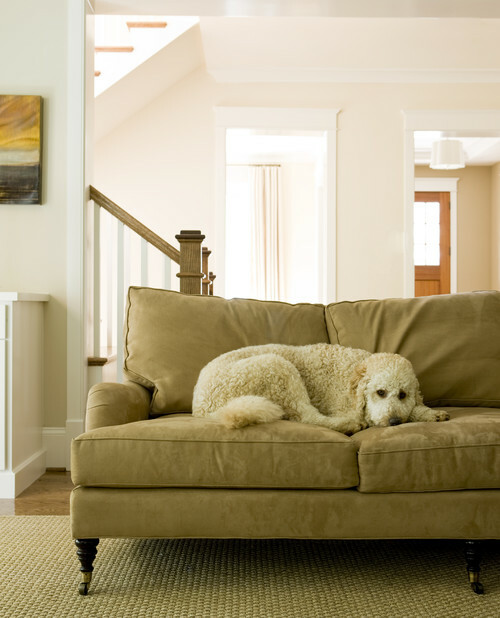 The comfy couch at the foot of the stairs is enjoyed by man’s best friend. If your couch is pet-approved, you know it’s gotta be comfortable. I love the slightly off-white walls with pure white trim. 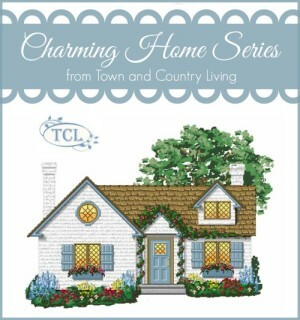 The color combination creates a fresh look, emphasizing the modern country style of the home. The dining room has minimalist appeal with a simple chandelier and a singular oil painting on the wall. 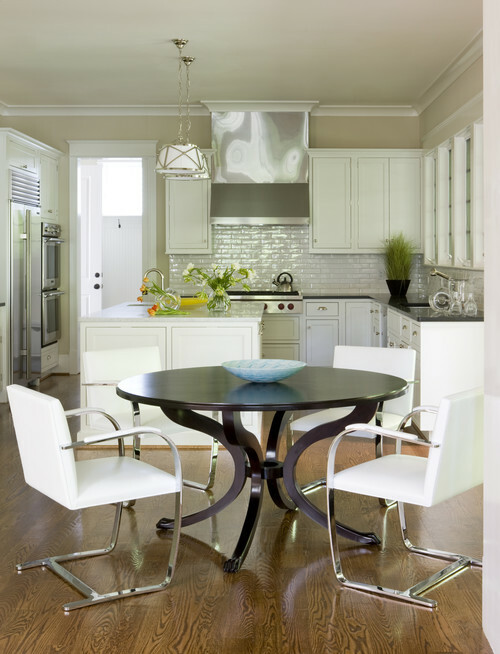 White subway tiles pair with white cupboards to create a light and bright modern country kitchen. A dark claw foot table adds contrast to the monochromatic space. 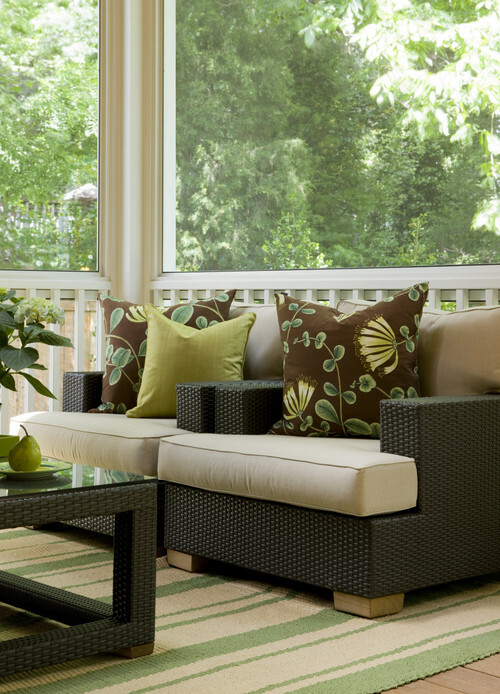 The Bethesda home includes a sun porch for enjoying warm summer days. A warm color scheme in the bedroom adds cozy appeal, along with the beautiful four-poster bed. An adorable chair and ottoman create a cozy reading corner in the bedroom. I love the capiz shell chandelier! 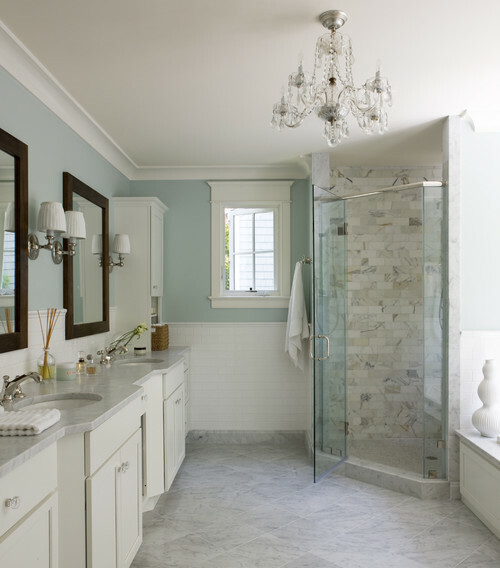 Soft blue creates a serene bathroom with a corner shower and pretty chandelier. The simplicity of this modern country home is inviting and livable. Sometimes I feel like rooms with less clutter are more stress-free. Maybe because there’s less stuff to dust. See more of today’s Bethesda, Maryland home over at Houzz. Beautiful, cozy and relaxed interiors. Beautiful home. I love the comfortable overstuffed furniture featured here, although I think it lacks just a little personalized decor. I’m not sure how I feel about off-white walls with pure white woodwork and trim. In this case it looks fine since everything is new and perfectly designed. In a “normal” person’s home where everything is not Pinterest perfect, I feel it appears as a slightly off paint choice. Just one person’s opinion, of course. You find such interesting home tours for us to comment on. The crown molding and ceiling work in all of the rooms are outstanding. I especially like the window dressing in the bed room. The blue bath makes you feel fresh and clean just walking in. The french doors reminded me of southern spring. The vent-a-hood in the kitchen is very unique. However the kitchen area would not be the thing for a family gathering. But…..I feel sure I could manage to live there and enjoy myself. I also think that less clutter =less stress. I’ve been getting rid of a lot of stuff, lots of which I never thought I would part with. I feel better after the space is clutterfree. I agree with the less clutter, less work theory. If only I could lose my affection for some of my “stuff.” And, along those lines, I was thinking as I looked at the coffered ceilings , who is going to dust them?